I’m actually going to break the reception post into two parts- events and decor. Today is all about the decor. And I should just start out by saying: wedding planning, it’s just not my thing. But I am a pretty decisive person, so when I settled on Navy for the bridesmaids dresses it was a pretty easy shift to Navy and White with the decor. 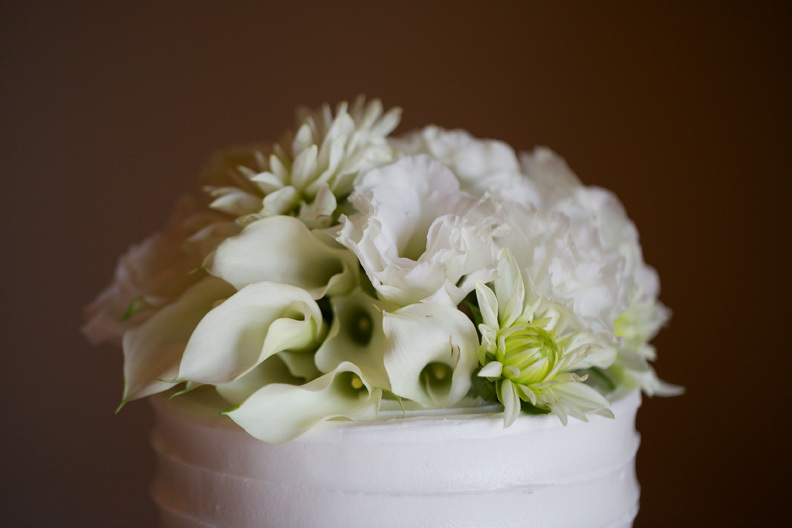 BUT there is a problem with Navy and white… white is pretty much your only flower choice. (you could choose blue, but there are very few naturally blue flowers and they are usually not dark blue) And the flowers were REALLY important to me (I think good flowers can make or break a space). 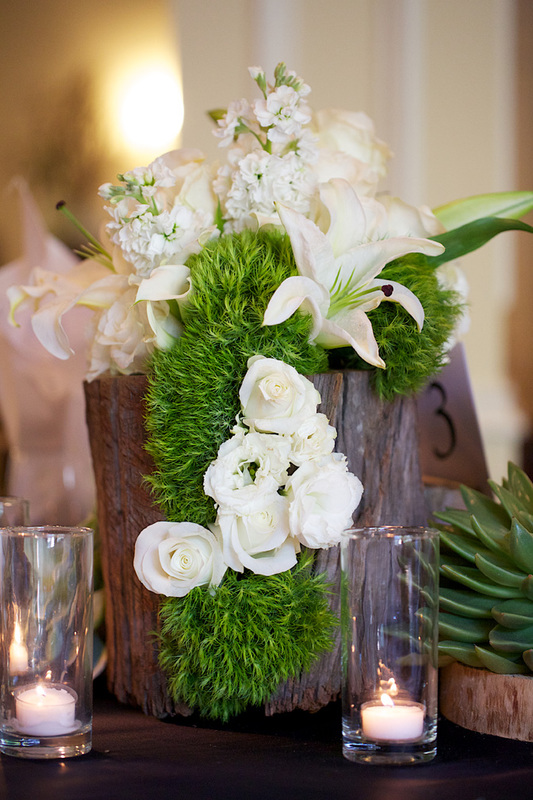 But solid white flowers seemed kind of boring to me, so I had this vision of adding in greenery with a lot of texture in it to make the white flowers a lot more organic and definitely more interesting. 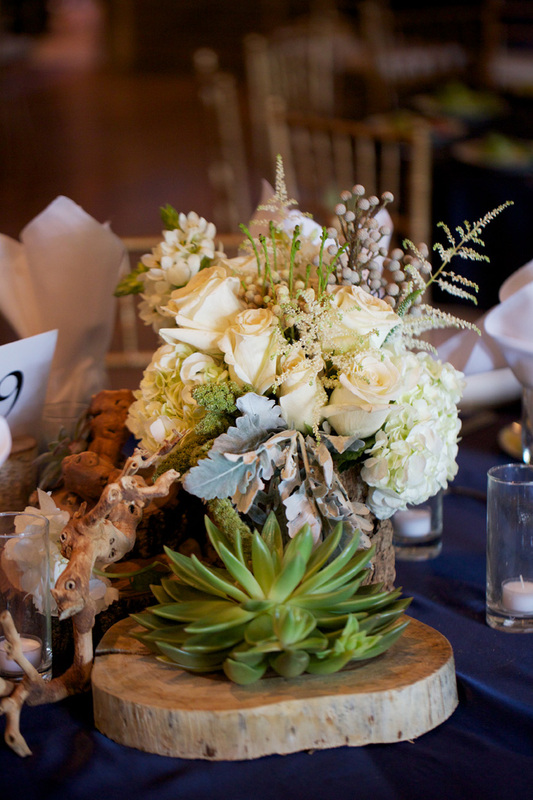 I met with 3 different florists and talked about my vision for the centerpieces but when I met with GRO Designs they TOTALLY got my vision, so we almost immediately hired them. And check out the amazing job they did! They also posted about our wedding on their blog here. Each table was a little bit different. 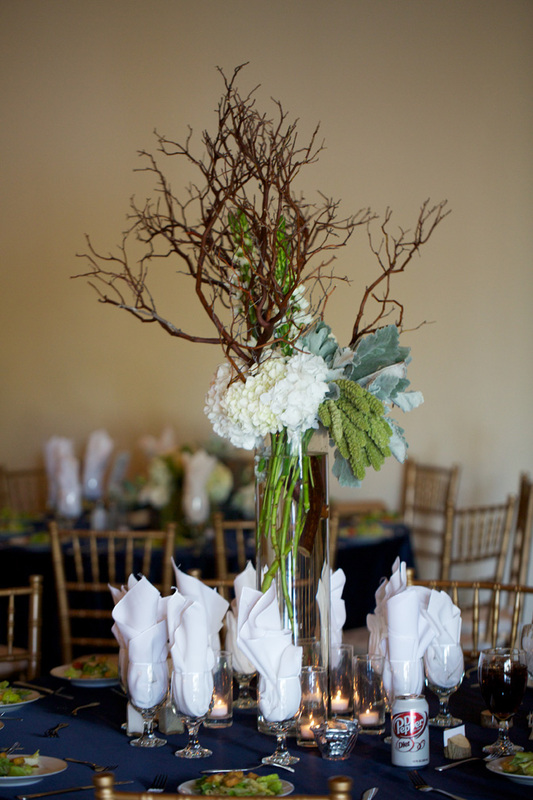 We had twenty five tables and 10 had tall centerpieces (like the one above) and 10 had shorter centerpieces (like the pictures below). One of the things I cared about was that people could have a conversation over the centerpiece, so I asked GRO to make them either short enough to be seen over or tall enough to be seen under. Mission Accomplished! 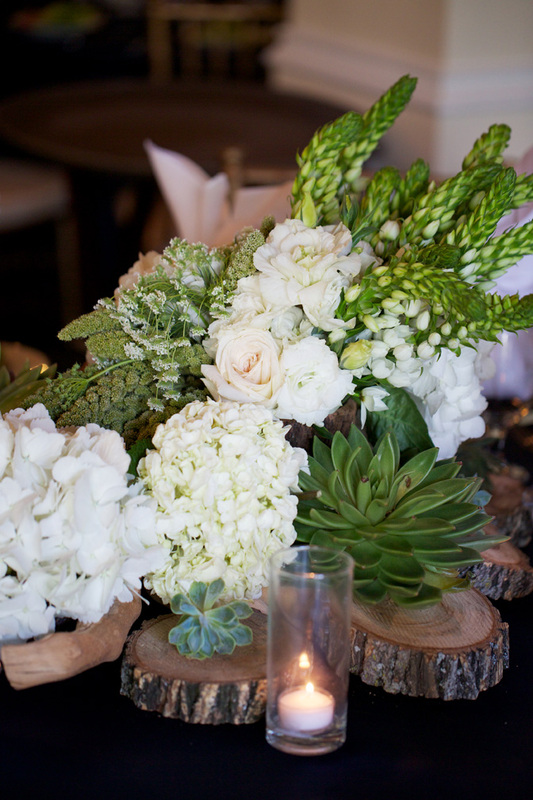 I love that each one was different but had elements of the same: wood, succulents, white flowers, textured greenery. Gro also provided the lighting to ‘set the mood’ at the tables. Even though our reception was early (5pm ish in the summer) and was well lit from the outside most of the time, I liked the candle lighting because it creates a certain atmosphere. The navy table cloths came from our caterer as well as the cake (Sweet Memories if you are curious). That cake was DELICIOUS. Flowers and Wedding Cake rank pretty high up there on my importance scale for a wedding reception. And I have to say, our vendors did fantastic jobs at both!! For the cake, Sweet Memories provided the cake, but GRO provided the flowers. Check out the flower explosion that happened on my cake! I LOVED how it turned out, I could not have been more pleased with the results!! 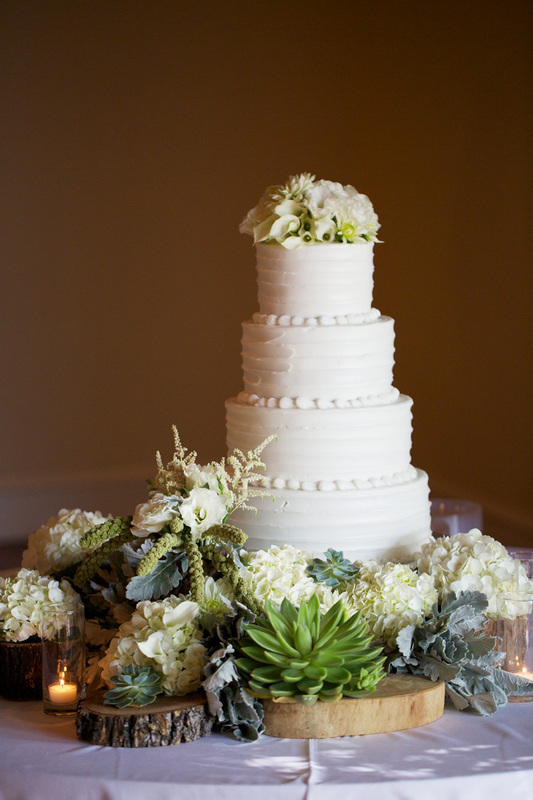 Delicious cake AND its beautiful… Perfection. 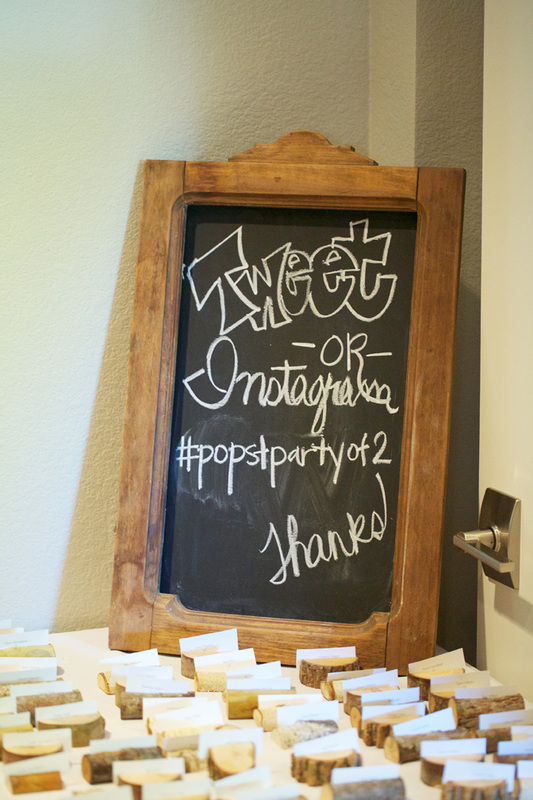 Our guests names were arranged in wooden name card holders that GRO provided so they could find their appropriate table and just for fun I decorated a wooden chalkboard that normally hangs in my kitchen to tell people what our social media #hashtags were for the night. I love this tradition that is starting, we only had a few participants, but I like being able to see everyone’s pictures from an event! And for our guestbook we had guests sign a book of our engagement pictures. (also done by Lauren Guy Photography). It has been the perfect way to save their sentiments as well as having a cute book of our engagement photos to look through! That just about wraps up what we had as decor! I thought it all turned out beautifully! Stay tuned Monday for a wrap up of what we had goin’ on at the reception! 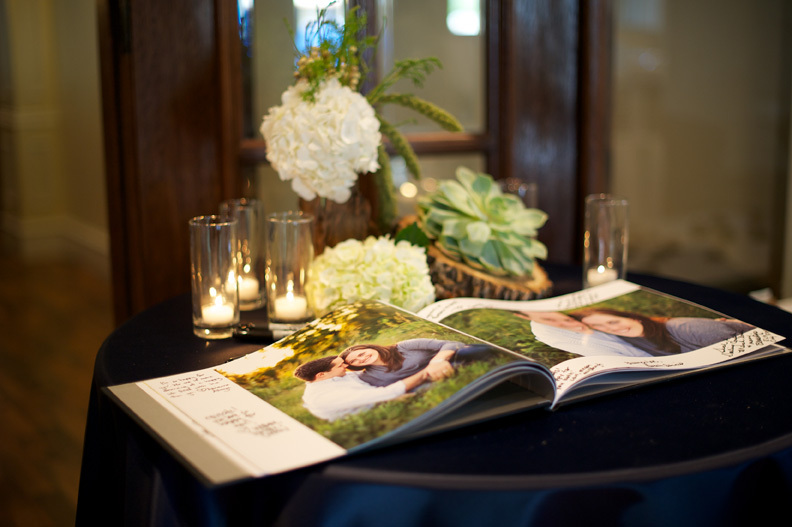 All photos on this post are courtesy of Lauren Guy Photography. These tables are stunning – so creative and unique. Thanks for sharing. Love your blog!